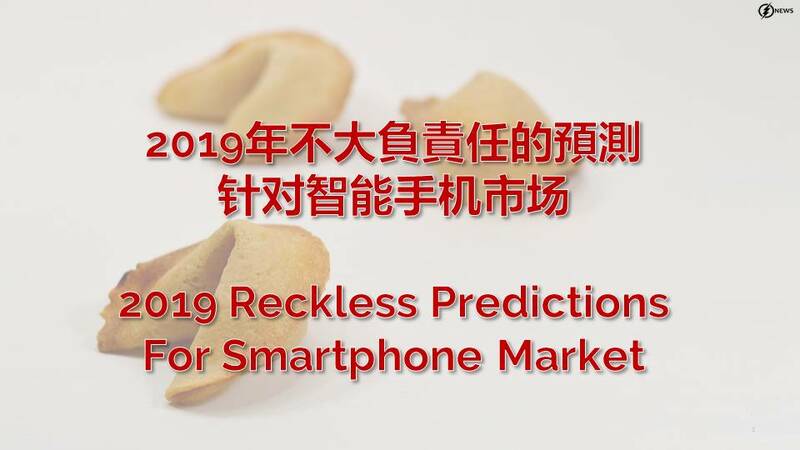 Basing on consultancy firms and securities firms, this report consolidates the trends of smartphone in 2019, with some reckless estimates. 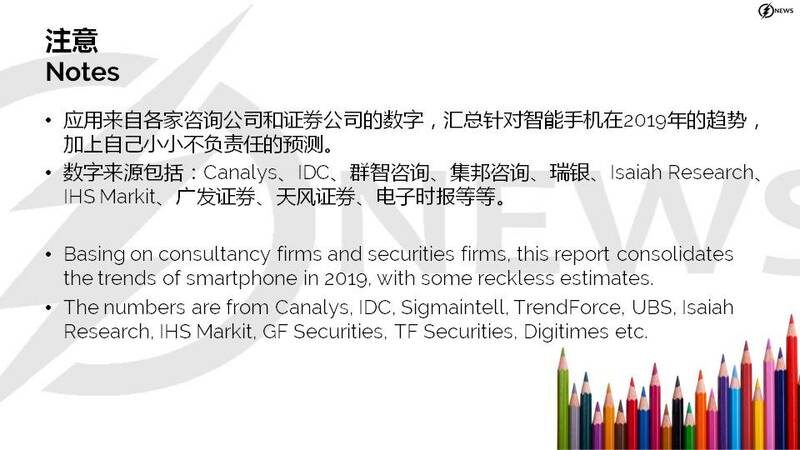 The numbers are from Canalys, IDC, Sigmaintell, TrendForce, UBS, Isaiah Research, IHS Markit, GF Securities, TF Securities, Digitimes etc. According to Canalys, in 2018, global smartphone shipment reaches 1.36B units, a 1.6% down on year. The number increases slightly (1.2%) to more than 1.38B units in 2019. 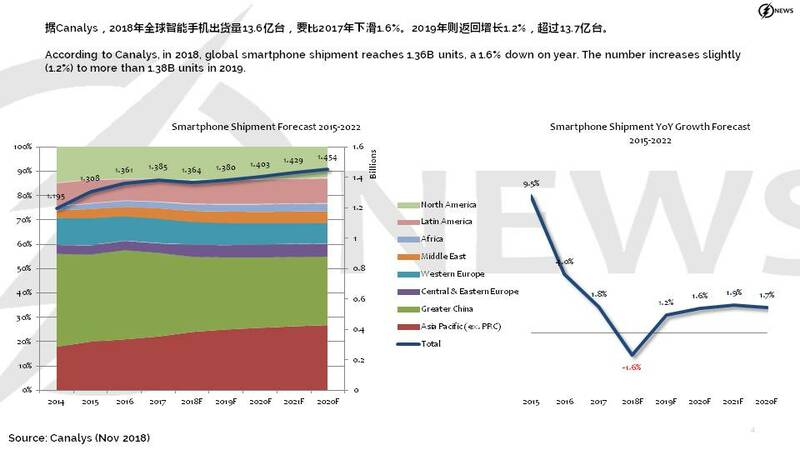 According to UBS, in 2019, Samsung is expected to continue leading the smartphone market, yet it continues to suffer from negative growth. 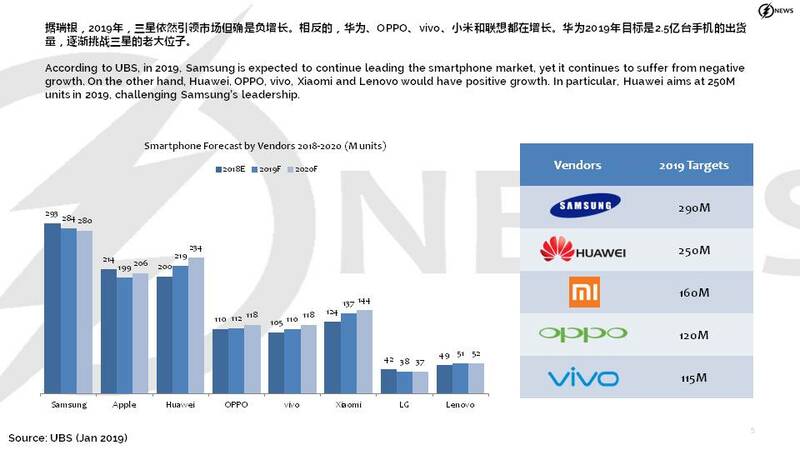 On the other hand, Huawei, OPPO, vivo, Xiaomi and Lenovo would have positive growth. In particular, Huawei aims at 250M units in 2019, challenging Samsung’s leadership. 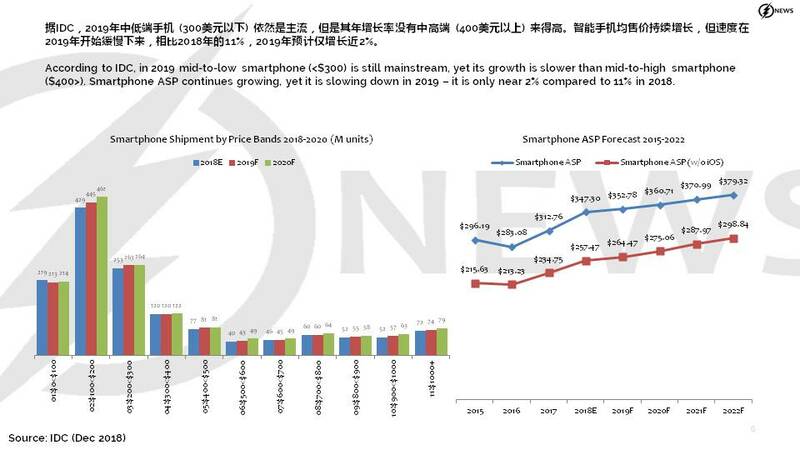 According to IDC, in 2019 mid-to-low smartphone (<$300) is still mainstream, yet its growth is slower than mid-to-high smartphone ($400>). Smartphone ASP continues growing, yet it is slowing down in 2019 – it is only near 2% compared to 11% in 2018. Full-screen smartphone boomed in 2017, and expects that in 2018 more than half of the smartphone equipped with full-screen. In 2019, Sigmaintell expects that the full-screen smartphone penetration rate would reach 86%, becoming the mainstream. 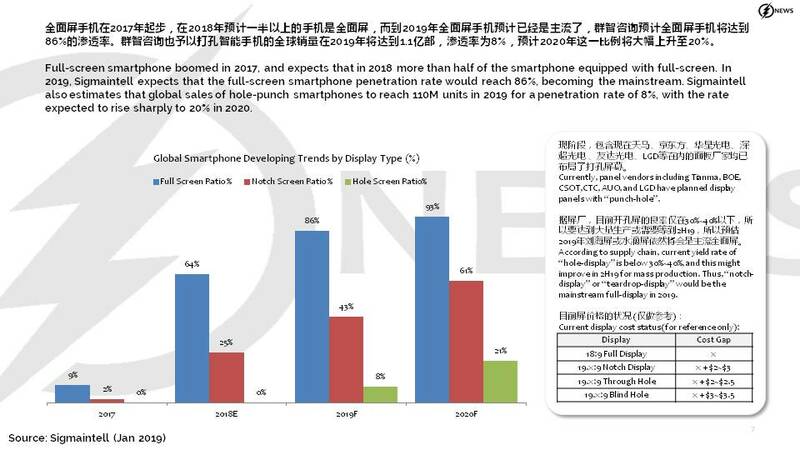 Sigmaintell also estimates that global sales of hole-punch smartphones to reach 110M units in 2019 for a penetration rate of 8%, with the rate expected to rise sharply to 20% in 2020. 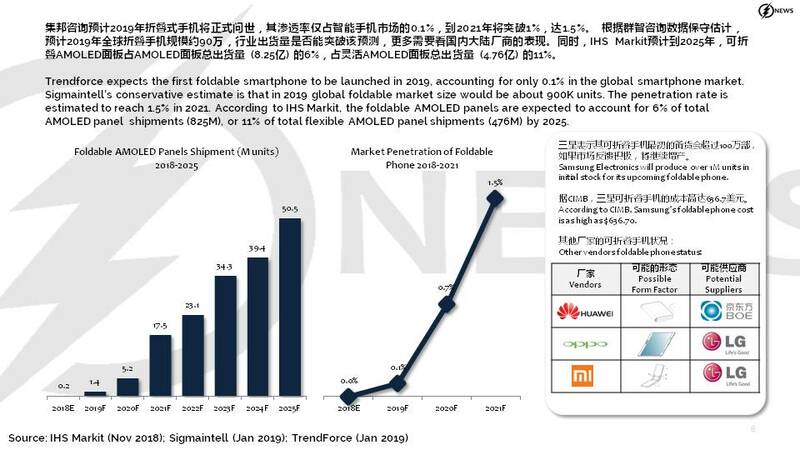 Trendforce expects the first foldable smartphone to be launched in 2019, accounting for only 0.1% in the global smartphone market. Sigmaintell’s conservative estimate is that in 2019 global foldable market size would be about 900K units. The penetration rate is estimated to reach 1.5% in 2021. According to IHS Markit, the foldable AMOLED panels are expected to account for 6% of total AMOLED panel shipments (825M), or 11% of total flexible AMOLED panel shipments (476M) by 2025. 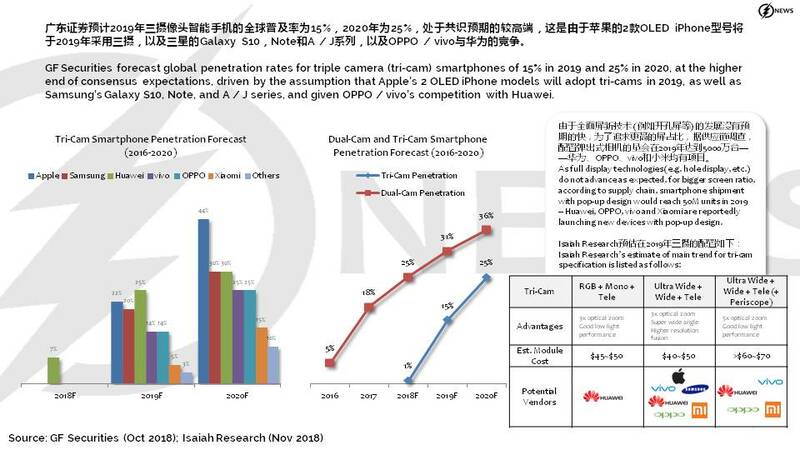 GF Securities forecast global penetration rates for triple camera (tri-cam) smartphones of 15% in 2019 and 25% in 2020, at the higher end of consensus expectations, driven by the assumption that Apple’s 2 OLED iPhone models will adopt tri-cams in 2019, as well as Samsung’s Galaxy S10, Note, and A / J series, and given OPPO / vivo’s competition with Huawei. 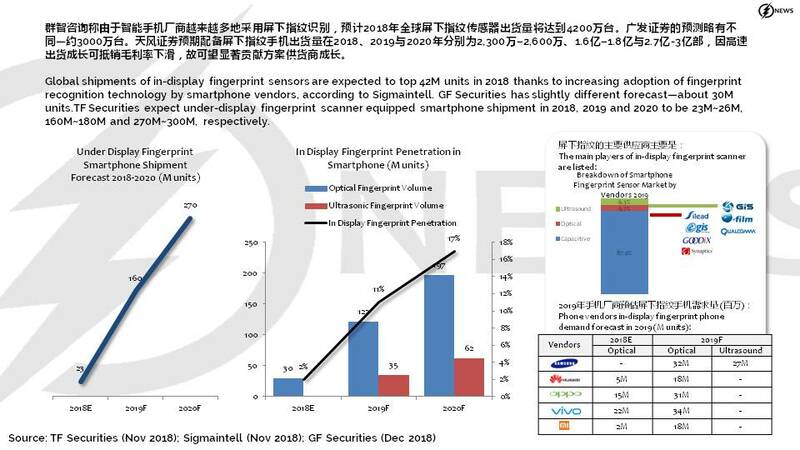 Global shipments of in-display fingerprint sensors are expected to top 42M units in 2018 thanks to increasing adoption of fingerprint recognition technology by smartphone vendors, according to Sigmaintell. 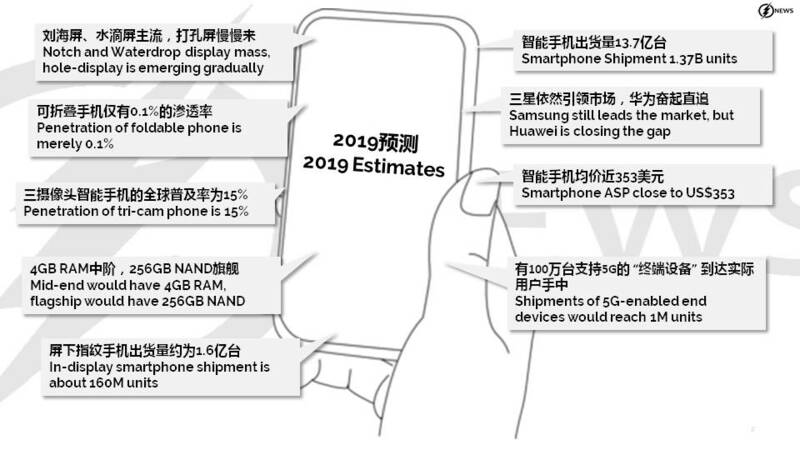 GF Securities has slightly different forecast—about 30M units.TF Securities expect under-display fingerprint scanner equipped smartphone shipment in 2018, 2019 and 2020 to be 23M~26M, 160M~180M and 270M~300M, respectively. According to Samsung, in 2019, the demand of 4GB RAM in mid-end smartphone market is increasing due to dual-cam and gaming; at the same time, the flagship in 2019 would demand 256GB NAND instead of 128GB, while the 64GB NAND will increase in the mid-end segment. 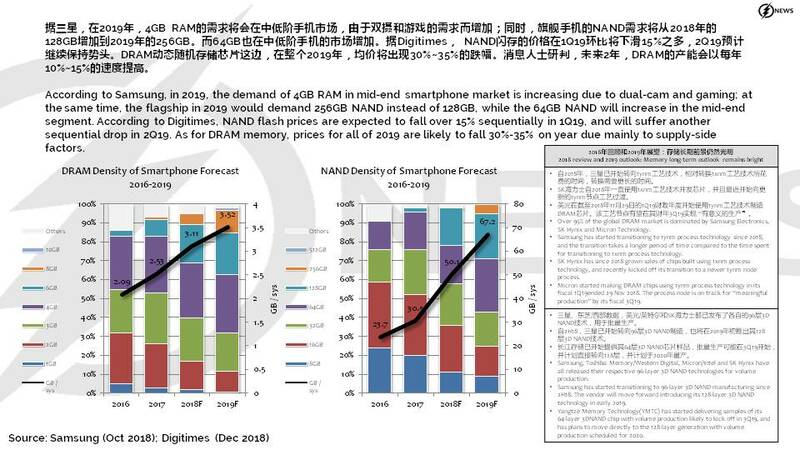 According to Digitimes, NAND flash prices are expected to fall over 15% sequentially in 1Q19, and will suffer another sequential drop in 2Q19. As for DRAM memory, prices for all of 2019 are likely to fall 30%-35% on year due mainly to supply-side factors. 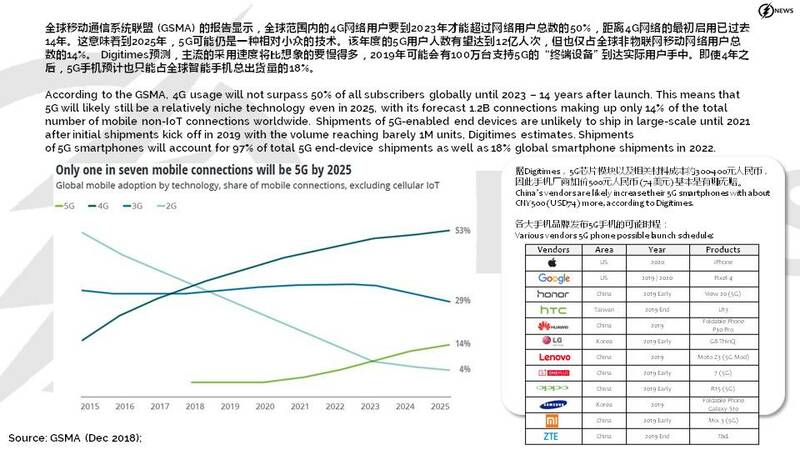 According to the GSMA, 4G usage will not surpass 50% of all subscribers globally until 2023 – 14 years after launch. This means that 5G will likely still be a relatively niche technology even in 2025, with its forecast 1.2B connections making up only 14% of the total number of mobile non-IoT connections worldwide. Shipments of 5G-enabled end devices are unlikely to ship in large-scale until 2021 after initial shipments kick off in 2019 with the volume reaching barely 1M units, Digitimes estimates. Shipments of 5G smartphones will account for 97% of total 5G end-device shipments as well as 18% global smartphone shipments in 2022. 01-29: TSMC has announced that for the second time in less than 6 months, a problem has caused issues with its chip production; Samsung has announced that the company will start taking steps in 2019 to replace plastic packaging materials with paper and other environmentally sustainable elements; etc. 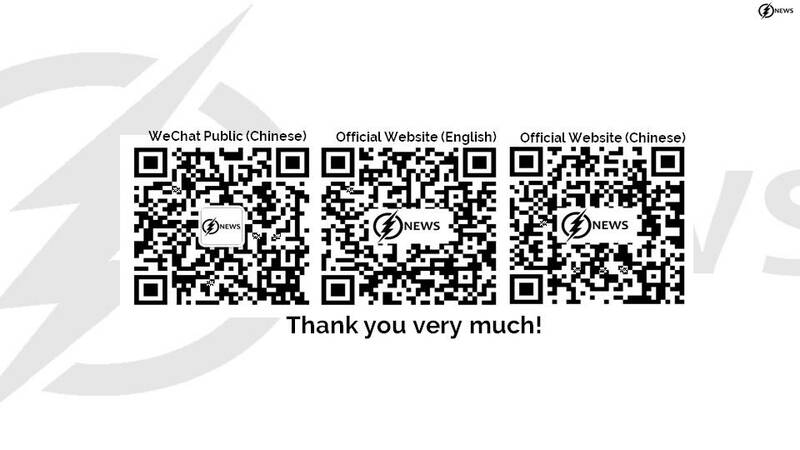 → ← 01-25 Week: Chinese New Year is coming soon… Last week recap.